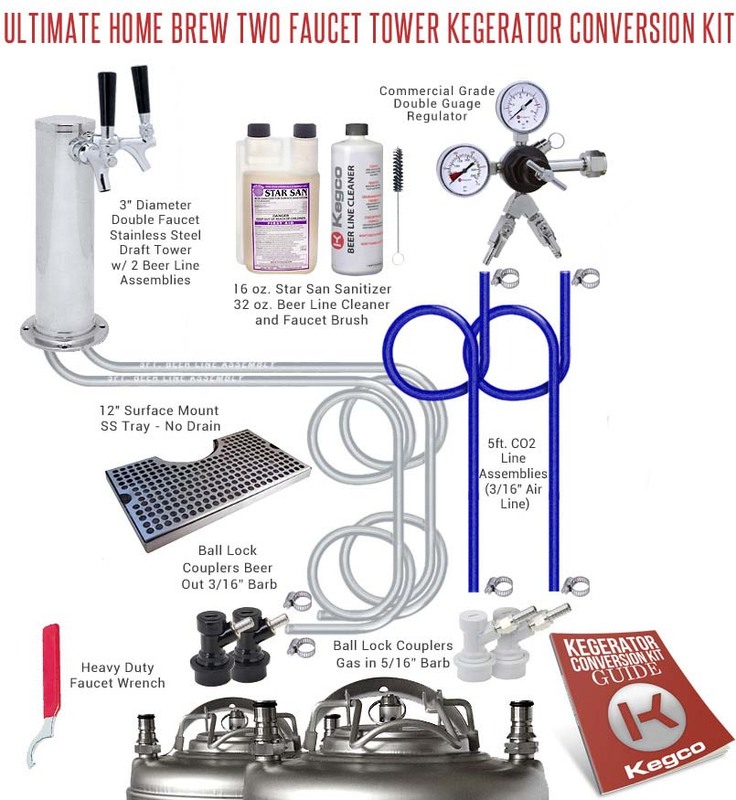 Kegco's Ultimate Homebrew Two Faucet Kegerator Conversion Kit makes it easy to quickly and successfully convert a compact refrigerator or chest freezer into high performance two produce home brew beer dispenser that is sure to be the highlight of your next pool party or barbecue. It has a 3" diameter stainless steel draft tower that allows it to be used in outdoor applications, and comes complete with all of the high-quality draft beer parts you'll need, including ball lock keg couplers and a dual gauge regulator. We've also included a stainless steel drip tray and a 32 oz. bottle of beer cleaner, 16 oz. bottle of Star San sanitizer, and faucet brush to make clean-up a breeze. Each Kegco conversion kit includes a detailed instruction guide, so you can feel confident in every step of the conversion process. This set of ball lock couplers is used to tap Cornelius Pepsi kegs, and includes both a gas in and beer out coupler for easy tapping of home brew kegs. The gas in comes with a 1/4" nut and 5/16" hose barb already attached, allowing you to quickly connect it to the same size air line that standard draft beer regulators use. The beer out connector has a 3/16" hose barb that connects to standard 3/16" beer line. Constructed from easy-to-clean stainless steel for ultimate style and convenience, this drip tray has been perfectly designed to catch drips and spills under multiple faucet towers. It has a cut out that wraps around a 3" wide draft beer tower column for a custom looking fit, as well as a fast draining, precision louvered screen that lifts out for easy cleaning.